The Greenback ventured to a two-week high against a basket of major currencies on Friday morning, amid investor optimism over U.S. tax reforms. Today’s main risk event for the Dollar will be the U.S. non-farm payrolls report, to be released latertoday,which should offer fresh insight on the health of the U.S. job market. With the ADP data released earlier in the week displaying that U.S. private employers added 190k jobs in November versus the 185k forecast, markets will be paying extra attention to see if the pending NFP headline figure produces a similar pattern. The fact that November’s U.S. employment report will be released before the last Federal Reserve meeting of the year, is quite significant and has the ability to impact market expectations of higher U.S. rates next year. Although expectations remain elevated over the Federal Reserve raising U.S. interest rates by 25 basis points next week, a smog of uncertainty remains over what to expect from the central bank beyond 2017. Much focus is likely to be directed towards average hourly wages, as disappointing wage growth may heighten concerns over stubbornly low inflation consequently clouding the prospect of higher rates in 2018. From a technical standpoint, the Dollar Index has broken above 93.80 which could encourage a further appreciation towards 94.00. A solid NFP report has the ability to instil Dollar bulls with enough inspiration to challenge the 94.00 resistance, with the next level of interest at 94.20. Alternatively, a November NFP disappointment with subdued wage growth may open a path back to 93.50. Sterling punched above 1.3500 during early trading on Friday as investors waited to see if Theresa May was able to secure a deal with the DUP and E.U. officials on the Irish border. An agreement between the United Kingdom and Ireland on the post-Brexit Irish land border is likely to come as a breath of fresh air for Sterling, as a major obstacle for opening trade talks with the E.U. will be eliminated. The GBPUSD has been supported by cautious optimism over the Brexit deal with prices trading around 1.3470 as of writing. A positive outcome in Brussels could boost the Pound further with 1.3590 in sight. Alternatively, a disappointing no deal outcome, is likely to send the Sterling tumbling like a house of cards back towards 1.3300. This has certainly been a bearish trading week for the EURUSD which has tumbled for five consecutive days. There is a suspicion that the key culprit behind the pair’s downside could be a strengthening U.S. Dollar. Taking a look at the technical picture, prices are turning increasingly bearish on the daily charts with the next key level of interest at 1.1730. 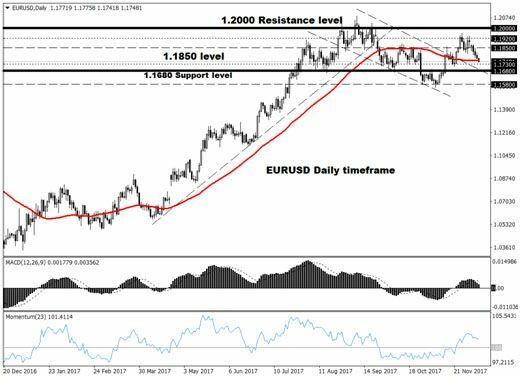 A decisive breakdown and daily close below 1.1730 is likely to encourage a further selloff towards 1.1680 and 1.1580, respectively. WTI Crude appreciated on Thursday with prices trading towards $56.70 on the back of a threatened strike in Nigeria which sparked fears of supply disruptions. Although short-term bulls may exploit the developments in Nigeria and growing Middle East political tensions to elevate oil higher, the question is for how long? With recent data showing an unexpectedly large rise in U.S. inventories of refined fuels last week, Oil markets still remain gripped by the oversupply woes. When keeping in mind how soaring output from U.S. Shale continues to complicate OPEC efforts to rebalance markets, oil is still exposed to downside risks. Taking a look at the technical picture, a failure of prices to stay above $56.00, may trigger a further depreciation towards $55.20. Alternatively, a breakout back above $57 could open a path to $57.60.